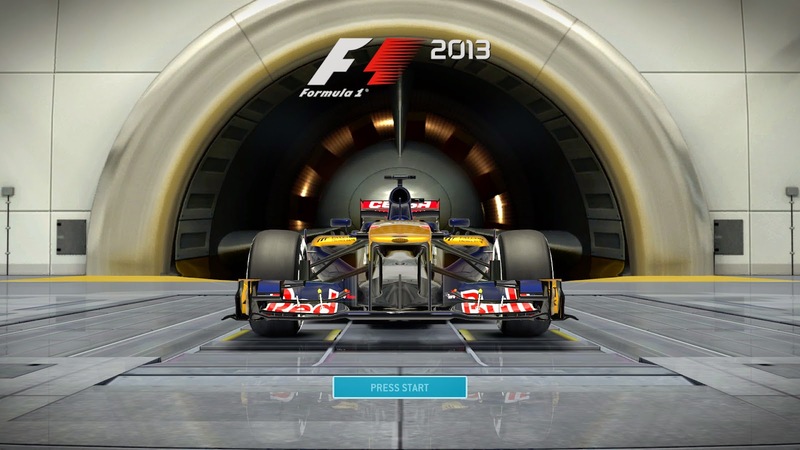 Just by the title screen alone, I could tell that the graphics for F1: 2013 were going to be spectacular. Needless to say, the graphics definitely did not disappoint. Every car is modeled superbly, the tracks look just as good as they would on their console game counterparts, and even the racing staff assisting you with your car are very well modeled. 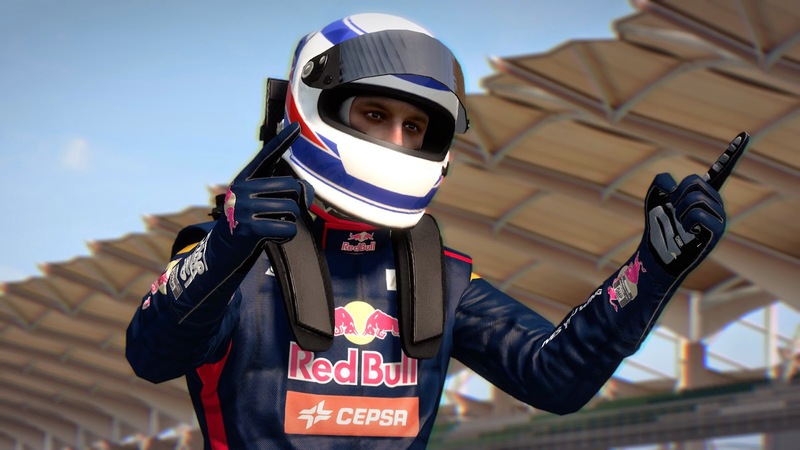 Codemasters clearly took great pains to make sure their game would look as lifelike as possible. The funny thing though is that one of the most realistic effects of this game also happens to be one of the most annoying. 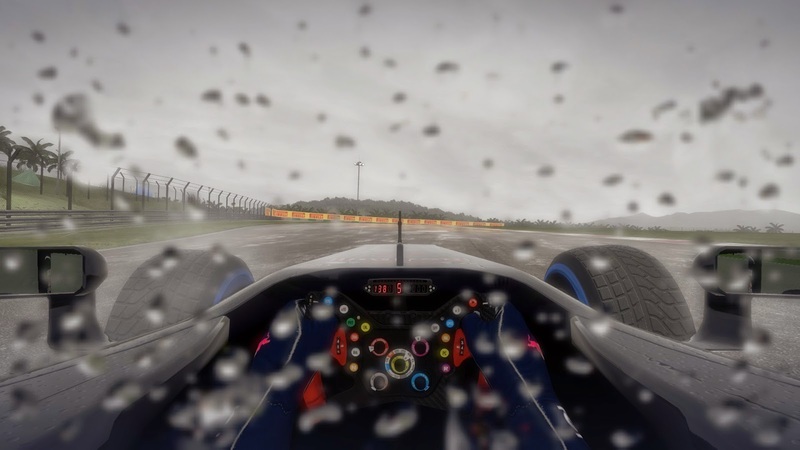 When driving in wet weather in first person cockpit view, water beads up on your helmet visor, hampering your vision. It is a really cool effect, but gets a bit annoying when you are trying to muscle your way around other cars. Codemasters also did a great job with the sound. The only music in the game is in the menus and replays, which is what I prefer in my racing games. The engine sounds of each car sound absolutely visceral; like you are actually there behind the wheel of a genuine Formula 1 car. Environmental noises, squealing tires, and even the sound of one of your tires bursting all sound incredibly realistic. 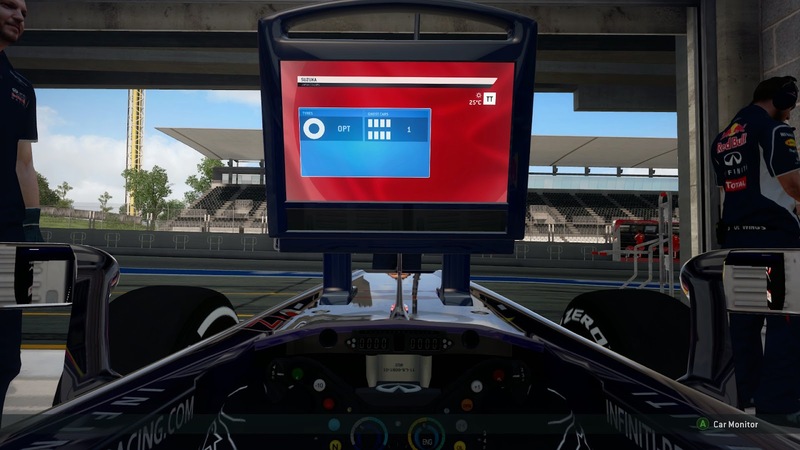 F1: 2013 tries to make its gameplay as realistic as its graphics, and I think Codemasters hit that nail on the head as well...as long as you disable all the driving assists that real Formula 1 drivers do not actually have. Wanting the most realistic experience I could get with an Xbox 360 controller, I disabled most of the driving assists during my play through. This proved to be quite a challenge during my first 30 minutes of play. Still kind of stuck in that semi-realistic mode of Forza Motorsport, I found myself constantly flying off the track. Once I had started getting my actions smoother, driving these extremely powerful machines became much easier. Unfortunately though, the Xbox 360 controller's trigger buttons still are not quite sensitive enough. I sometimes find myself pressing on the left trigger too hard, causing the brakes to lock up, or pressing the right trigger too hard, causing the car to oversteer out of a corner. days of a typical Formula 1 race weekend: practice, qualification, and race day. As in a real Formula 1 race weekend, you are only allotted a certain number of tires, which makes practicing a bit tricky since you do not want to go all out during the entire period and waste all of your tires. During qualifying, you not only need to figure out what type of tires you want to do your qualification with, but you also want to figure when to make your way on to the track. The entire time you are doing your qualifications, the computer is running on the track as well. Do you play it safe and do your run when there are few cars on the track, or attempt to take advantage of the other cars and do your run when the track is crowded? Race day brings about the most planning. You need to plan your pit stops a head of time, figuring out if you want to change tires, the amount of fuel going into the car, and which lap to head into the pit lane. This game is definitely a mix of real-time strategy and racing. One of the more interesting gameplay features of F1: 2013 is the classics mode. 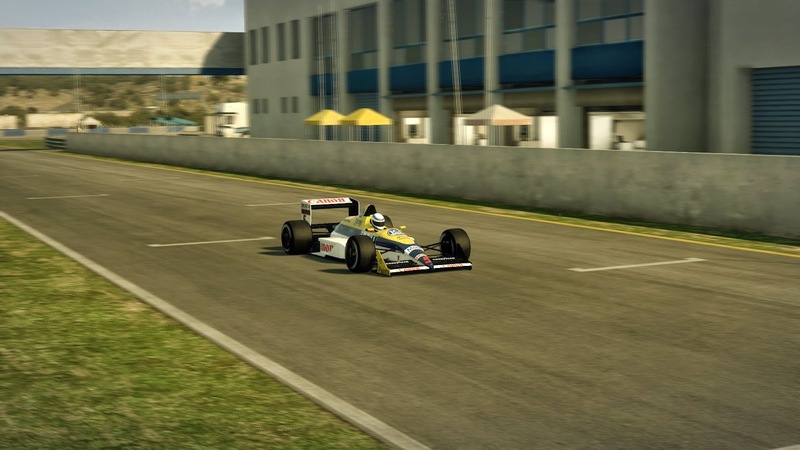 This mode allows you to drive some of the more iconic Formula 1 vehicles from the 1980s and early 1990s. The only gameplay mode not available in classics mode is the full career mode. Driving these older Formula 1 cars presents its own set of challenges. Compared to their modern counterparts, the older Formula 1 cars are much more squirrely, and lack such modern Formula 1 car features like traction control, the Kinetic Energy Recovery System (KERS), or the Drag Reduction System (DRS). Despite these lack of modern features, the older Formula 1 cars feel much faster that their modern counterparts and are actually more fun to drive. 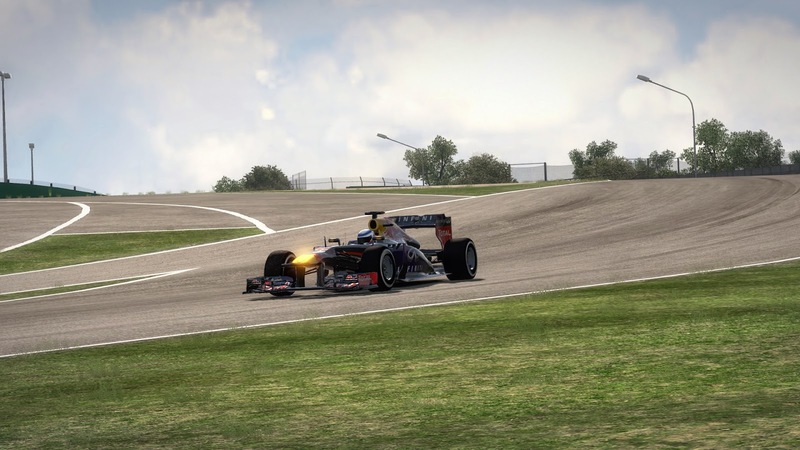 Overall, I highly recommend F1: 2013, especially if you are a huge Formula 1 fan. The game would probably play much better if you have a steering wheel and pedals for your PC, but if a controller is all you have, you can still get by. If realistic racing games are not your cup of tea, then this is definitely not the game for you. The game does have a steep learning curve, and does require a bit of planning before jumping into a full on career race. Sure, you can turn on all of the driving aids and make it more into an arcade racing game than a simulator, but that would take all the fun out of this game.